The polar bear is faced with extremely cold temperatures and the threat of extinction, because of human interjection and globalization, climate change and increased hunting activity. Yet they continue to be a symbol of strength and power. “The white bear is a bear that survives in the worst conditions,” said Kim Picard, a member of Aboriginal music group Odaya, who performed at the march for missing and murdered indigenous women on Sunday afternoon. “Feel free to move around a bit,” said Moe Clark, who joined Odaya, of the -40 C weather with windchill. 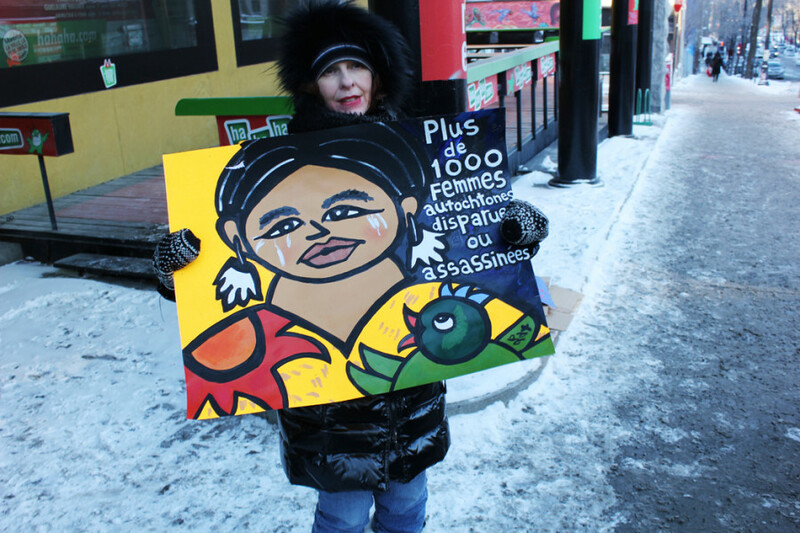 On this cold Valentine’s Day Sunday at St. Laurent metro, hundreds of people gathered to show solidarity for the thousands of missing and murdered Indigenous women across Canada. In December 2015, the federal government launched a national inquiry into this longstanding issue. According to a RCMP report, there have been at least 1,200 missing and murdered indigenous women since 1980, but some argue it could be as high as 4,000. Carolyn Bennett, Minister of Indigenous and Northern Affairs, Jody Wilson-Raybould, Minister of Justice and Attorney General of Canada, and Patty Hajdu, Minister of Status of Women have held meetings with families and survivors on the best way to approach the task force. At the march, Liberal Member of Parliament for Quebec’s Manicouagan riding Michèle Audette expressed hope for the future. “I have to say, when you have 30,000 [signatures] to demand, to urge the government to have a national public inquiry, it shows me de l’espoir,” Audette said. “It was very, very tough,” she said, hugging her young daughter, who joined her at the front of the crowd. The systemic racism resulting in at least 1,200 missing or murdered Indigenous women since 1980 has been recognized by the federal government for decades—but is only being addressed with action now. 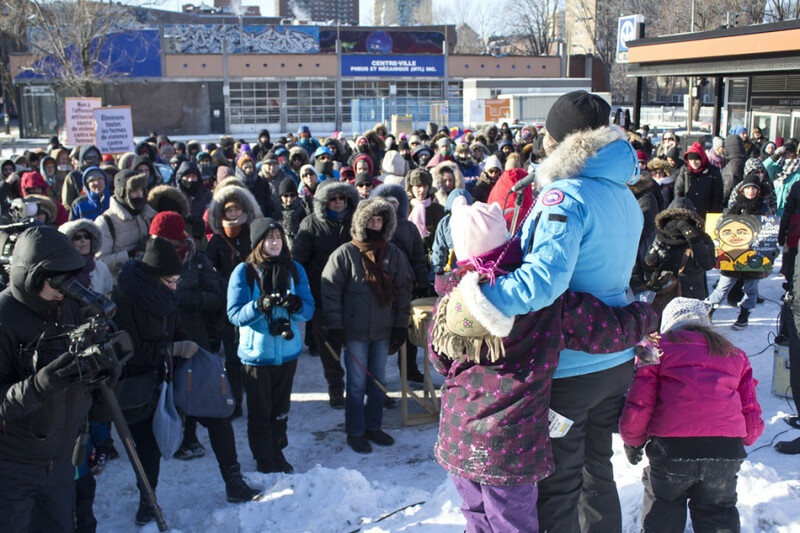 After hearing testimonies from family members of women who had gone missing or been killed, speeches from officials from various Indigenous groups, and performances by musicians, the group began its march up St. Laurent Street. The group of about 300 people stopped just before Sherbrooke St. to continue the presentations. At this point, it was getting cold. 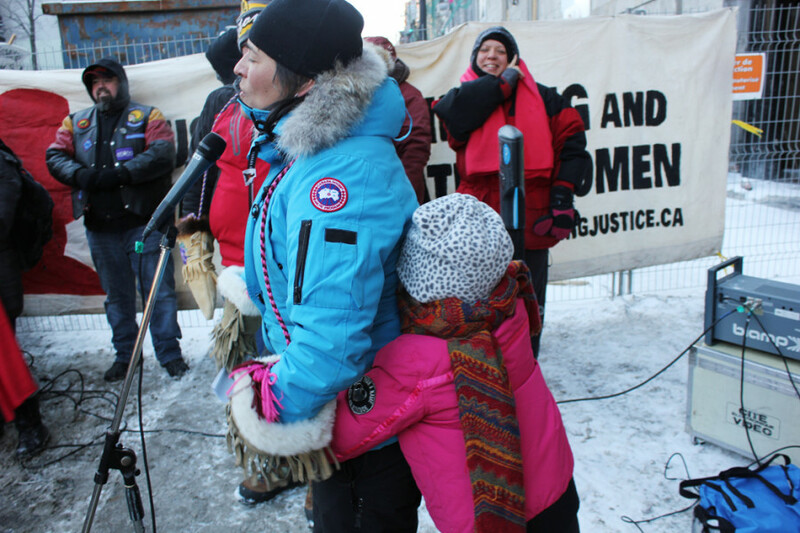 The crowd was moving as one being, staying warm by sticking close to one another, and dancing to the music played by indigenous rights activist Marie-Josée Tremblay. MP Audette ended the demonstration by calling for everyone in the crowd to turn to the person next to them and give them a hug. 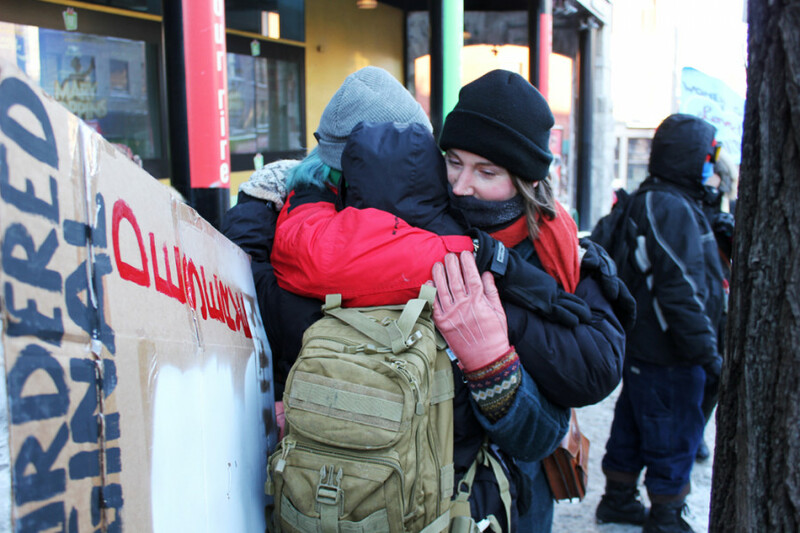 Strangers embraced one another to show solidarity in this time of tragedy, and to keep warm in the especially cold weather. Those who attended the march embodied the White Bear. They braved the cold, and showed they would not be silent and let this injustice take place. Even the harshest conditions will not stop people from standing up against institutionalized abuse.